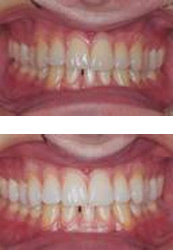 Getting that “Hollywood Smile” is a regular pastime and the number one requested cosmetic dentistry procedure. While many people buy whitening products online or from the supermarket, our professional clinic whitening procedure is safer and produces better results, in only a fraction of the time. Want to know more? Contact Smile Makers Whitsundays and we’ll gladly provide you with the pros and cons of the different types of whitening procedures. When it comes to teeth whitening (bleaching), it’s always best to begin at our practice. We can advise you on whether you are a good candidate for teeth whitening. Those people with yellowish teeth typically have better results than those with brownish or grayish hues. Also, whiteners have no effect on tooth-colored composite fillings or teeth that are bonded, so whitening will only make these teeth stand out from the ones that do whiten. Are In-Practice Procedures Better than At-Home Procedures? The whitening procedure that we do at Smile Makers Whitsundays generally takes about an hour and the results are immediate. After ensuring that the gums are protected, a bleaching agent is applied to the teeth and it does all the work! Our practice also dispenses take-home kits along with a custom-made mouthpiece to ensure a high quality result. Want to be really safe? Schedule an appointment with Smile Makers Whitsundays and let us make your smile shine! Give us a call to set up a convenient time to meet. You’ll be happy you did!